I’m not an economist. In fact, the only formal education in economics I received was my high school government and econ class, in which I learned that a dreamy student teacher can be very distracting. But don’t let my lack of credentials detract from my message. I am notoriously bad with money in both theory and practice, but even I can recognize the economic disparity in the U.S. The situation could use some help from the private sector, and the answer is so obvious that I’m sure I’m not the first one to point it out. Use the money people were willing to spend to make and then view Paul Blart: Mall Cop 2 to feed America and improve its schools. 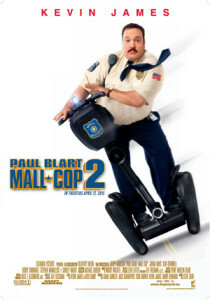 Please understand that Paul Blart: Mall Cop 2 is just a symbol. When I learned that there was to be a sequel to Paul Blart: Mall Cop, I was perplexed, but I shouldn’t have been. The movie industry is always giving us sequels we didn’t even know we wanted. I’m no enemy of art, and I have a well-documented relationship with silly movies. However, it cost $26 million to make the first Paul Blart: Mall Cop movie. That is a lot of money. Just that could feed and educate so many people. If we add in the $146 million that people spent on watching Paul Blart: Mall Cop, we’re feeding and educating even more people. I don’t know how much it costs to feed one person for a year, and I don’t know how much it will cost to fix all the crumbling schools across this country. I bet $172 million would help. Perhaps living in California all these three months has made me more attuned to excess. There is a lot of attention paid here to conserving natural resources (like water), but money is not a natural resource. There is no reason to conserve it. Let’s spend it. “I start making a deal, inspired by gravity”	“Alone But Not Lonely” is one of my favorite songs.